Thursday, February 7, 5:30 p.m. Gentlemen of Verona interpretation; Improv performance at 6:30 p.m. In collaboration with The St. Petersburg Celebration of the Arts, Florida CraftArt will present a lecture and improv performance featuring William Shakespeare’s Gentlemen of Verona. 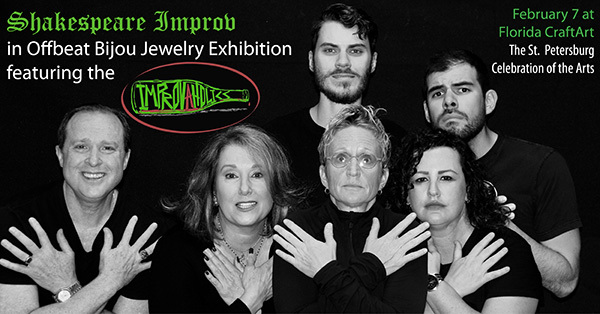 Set among the jewelry exhibition “Offbeat Bijou” the troupe Improvaholics will involve the audience in a humorous and poignant interpretation of the bard’s play. Refreshments will be offered on February 7 at 5:30 p.m. with a play interpretation at 5:45 p.m. and Improv at 6:30 p.m.
Additional programming includes docent tours every Wednesday at 1:15 p.m. and a jewelry-making demonstration by ArtLofts artist Julie Dye on February 13 at 1p.m. Florida CraftArt is located at 501 Central Avenue in St. Petersburg. For more information, visit www.FloridaCraftArt.org or call (727) 821-7391. Admission is free. Hours are Monday through Saturday, 10 a.m. to 5:30 p.m. and Sunday from noon to 5 p.m. Florida CraftArt is a nonprofit organization founded in 1951 and headquartered in St. Petersburg. Its mission is to grow the statewide creative economy by engaging the community and advancing Florida’s fine craft artists and their work. Fine craft art is presented in its 2,500-square-foot retail gallery and curated exhibitions are featured in its adjacent exhibition gallery. Florida CraftArt is the only statewide organization offering artists a platform to show and sell their work. Improvaholics.jpg: Improvaholics actors are (bottom row, from left), Bill Cummings, Susan Guidi, Sandra Lake, Anne Jones; (top row), Kevin Kravitz and Steven Sanchez.